Thursday night was twice as nice for PPOTN recipient Bryan Rust, who led Pittsburgh to a Game 7 win over Tampa Bay in the Eastern Conference Final. 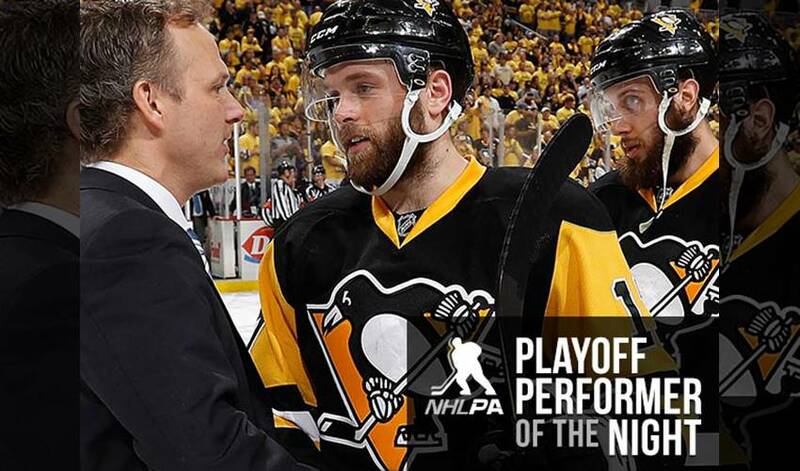 The forward and his teammates will now face the San Jose Sharks in the Stanley Cup Final. The right-winger had both goals for the Penguins in the 2-1 home victory, played in front of 18,638 people. STAT PACK: Rust took five shots on goal, was a plus-2, recorded two hits, and took 21 shifts in 11:12 of ice time. SID’S TAKE: “With Rusty's speed, he's really able to push the pace, and he's shown he's able to finish too,” said Sidney Crosby. JOIN THE CLUB: Rust registered his second career multi-goal game in the postseason, both of which have come in series-clinching wins (also Game 5 of FR vs. NYR: 2-1-3). He became the second rookie in NHL history to record multiple goals in two series-clinching wins within a single postseason. The other: Chicago’s Jeremy Roenick in 1990. JOIN THE CLUB, PART 2: Rust became the fourth player in Penguins history – and first rookie – to post multiple goals in a Game 7. The others: Jiri Hrdina (1991 DSF vs. NJD: 2-0-2), Sidney Crosby (2009 CSF at WSH: 2-1-3) and Max Talbot (2009 F at DET: 2-0-2). SEVENTH HEAVEN: Rust also became the eighth different rookie in Stanley Cup Playoffs history to score twice in a Game 7 and the first to do so since New Jersey’s Adam Henrique in the 2012 Eastern Conference Quarterfinals at FLA (2-0-2). REVVING IT UP: Rust has scored five goals through 17 games in the 2016 Stanley Cup Playoffs (5-3-8), equaling a Penguins record for a rookie in a single postseason (Michel Briere: 10 GP in 1970). Rust’s five playoff goals also match his career total from his 55 regular-season appearances (5-8-13). HAPPY BIRTHDAY: Rust shares the same birthday (May 11) with NFL quarterback Cam Newton, NFL receiver Jeremy Maclin, painter Salvador Dali and fellow NHL player Brad Marchand. HONOURABLE MENTIONS: Evgeni Malkin had two assists and Matt Murray made 16 saves for the Penguins. Andreai Vasilevskiy made 37 saves for the Lightning.